To further complicate matters, remember that the proficiency is about the style, not the weapon. If I have a lightly curved one-handed sword of medium length and a buckler, I could use those two weapons with the Sword & Shield, Sword & Buckler, Messers, or Sabers. Same weapons, but four different styles of fighting that will emphasize different things, with the latter two being more specialized than the previous two. You can't rename Sword & Buckler or Sword & Shield as anything that would prevent me from using a saber with it. higgins wrote: That's just Italian for "sidesword". Well yeah. And Messer is just German for "knife". higgins wrote: Also, messer and falchion are completely different things. I don't know about "completely" different. Messer actually evolved from Falchions and the way they used is largely the same. What differences they have is largely to do with construction. higgins wrote: Virtually all swords have a taper. Obviously it refers to swords with a large distal taper. I was trying to differentiate between narrow and broad blades without using "Broadsword". But you already pointed out I.33 swords, so never mind. Agamemnon wrote: To further complicate matters, remember that the proficiency is about the style, not the weapon. So Sword Fencing would be appropriate to sub for Sword and Buckler? Agamemnon wrote: You can't rename Sword & Buckler or Sword & Shield as anything that would prevent me from using a saber with it. It seems to me that "Sword & Buckler" prevents Mass Weapon + Buckler or Rapier + Main Gauche exactly as much as renaming to Rapier would prevent Sabers. thirtythr33 wrote: I don't know about "completely" different. Messer actually evolved from Falchions and the way they used is largely the same. What differences they have is largely to do with construction. Again it comes back to style. Falchions were mainly a battlefield weapon, whereas if we look at treatises, it seems like messers were a popular weapon for unarmored, grapple-happy dueling. Now, I'm sure both of those weapons could function equally well in the other category, but the fighting styles employed in those two situations are completely different. As a consequence, if a character had a hefty single edged blade and both Messer and Sword & Shield proficiencies at equal levels, he could easily choose the style that a situation calls for -- say, taking advantage of a shield when he is able to do so, or opting for the bad breath distance techniques when fighting an assassin on the street. Obviously it refers to swords with a large distal taper. I was trying to differentiate between narrow and broad blades without using "Broadsword". You probably meant lateral or profile taper. Swords with a pronounced distal taper generally don't have as much profile taper and vice versa. 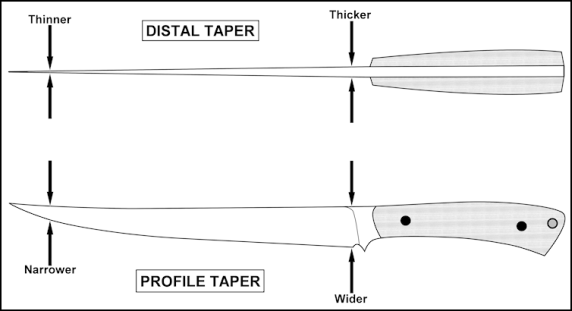 In my experience, distal taper tends to be THE factor that makes or breaks the handling characteristics of a sword. When visiting Poland last summer, I chose the best handling sword that I could afford. It went a bit beyond my budget, but the handling was totally worth it. Then it turned out that the distal taper was far too good -- so good, in fact that the blade didn't pass the 2mm edge thickness safety requirements in the upper portion of the blade. If had known I had to return it, I'd have used my camera when I took the initial picture, not my damn phone. So, when returning the blade, I had two options -- either to go for a blade that had no distal taper whatsoever, or then a middle ground option which had some distal taper. Of course, I chose the latter. It passed the 2mm test, but only just. Since it's such a borderline case, I'm still getting the stink-eye in the weapon check every time. My training beater has a very similar profile to my tournament sword, but it doesn't have any distal taper whatsoever. As such, the tournament sword is way more agile in the hand. thirtythr33 wrote: So Sword Fencing would be appropriate to sub for Sword and Buckler? Fencing is again one of those weird words. For us 20th century people it has a "sports fencing" "light weapons" connotation, but as I get it, many of the HEMA circles are trying to bring back the original meaning of the term, which basically encompasses all weapon fighting (as opposed to unarmed fighting). Or at least that's the general impression that I've had. If it still bothers you in the beta, then feel free to call us out on it again. Battlefield Swordsmanship vs Civilian Swordsmanship to replace Sword and Shield vs Sword and Buckler? Given that medium to large shields tend to be more of a battlefield fixture than something you'd see in a civilian context, that seems to be less ambiguous. My opinion: Just stick to the names you chose. They're not Shakespeare, but easily understandable and can be altered by anyone if need be. These are again major blanket statements. First off "Battlefield Swordsmanship" surely sounds like it includes longswords. Then we have Capo Ferro with its rotella (aka medium-size shield) that seems to be decidedly civilian duel oriented. Plus we have to think of adaptations -- if I'm running a viking game, "Battlefield Swordsmanship" brings shield walls in mind, which isn't at all what we're talking about. I don't want to shut down the discussion, but... if it's still a problem after you read it in full context, necro the crap out of this thread. As it turns out, I did mean profile taper. Battlefield swordsmanship vs. Civilian swordsmanship also has the issue that sword and buckler (of the I.33 variety) was also used on the battlefield. If you were a crossbowman, archer, pikeman -- anyone who wasn't at liberty to carry a shield -- then you very likely had a sword and buckler, as bucklers have the advantage of being able to be worn like a side-arm. Marras wrote: And l.33 is...? The fact that i.33 and other historical manuals are brought up kind of highlights the awkwardness of naming things. On the one hand you are trying to be as historical and authentic as possible, by citing real world sources. When referring to historic fighting styles we refer to them usually by the person who wrote the treaty, the name of the area or period it was practiced. Examples include Liechtenauer, Talhoffer, Italian Fencing, Elizabethan Fencing, Baroque style, Rocco style etc. The problem is that Band of Bastards isn't set in the real world, it is fantasy. Since it breaks verisimilitude to name something in fantasy after something historic we have to try to come up with new (and precise) nomenclature to uniquely identify historic styles without using any of the words that directly refer to them! It's even harder for Band of Bastards because you aren't shipping with an entire setting of your own where you could introduce your own terminology like the Loctineer style or Elvish Fencing. Which is precisely why we use the terms we do, for the most part. In most circles that we've been exposed to, and in the research we've done, the style is frequently referred to as "sword and buckler." So that's what we went with. Later styles deviate from this to some degree, but in terms of what we can actually model they are more alike than they are different. The two main exceptions to this are the style of fighting that seems specific to messers (which we wound up calling, predictably, Messers) and sabers (which follows a similar naming convention). Even those two styles are fairly similar in kind and application to Sword & Buckler in terms of what maneuvers they have access to, but they earned their own proficiencies by virtue of having a suitably different emphasis that we could highlight. On a related note: the Spear proficiency has officially been separated out of Polearms. The former now covers spears of all types, both with and without shields and retains the original emphasis (reach control) that it had under polearms. The Polearms proficiency now has a couple new tricks up its sleeve, including its own emphasis that takes advantage of the greater leverage polearms have compared to other weapons. Agamemnon wrote: On a related note: the Spear proficiency has officially been separated out of Polearms. The former now covers spears of all types, both with and without shields and retains the original emphasis (reach control) that it had under polearms. The Polearms proficiency now has a couple new tricks up its sleeve, including its own emphasis that takes advantage of the greater leverage polearms have compared to other weapons. Nice to hear! I'm really looking forward to read your masterpiece! Given that the proficiencies are more like combat styles than proficiency with specific weapons, a thought occurred to me (a few hours ago when internet was down - thank god for index cards): why name the proficiencies after weapon types at all? Given that there is an implied setting, why not name them after who might use them? This is largely stolen shamelessly from inspired by RuneQuest 6, wherein a combat style allows you to use any related weapon (usually 3 or 4 weapons will be covered) at that level of proficiency (so the Hoplite style might give you access to spears, javelins, one handed swords and shields), and then any weapons you use which don't fall under one of your styles default based on how similar they are to a weapon in a style you do have. While this might mean that some of the names are less universal, it might also make them easier to rename (particularly for individual characters) - and could in future make it easier to add new proficiencies (or even, dare we hope, a proficiency codex ). Oh - and if the above actually sounds like a good idea, please leave any further codex design/redesign until after the beta is released . Based on what have been written here I have understood that proficiencies grant maneuvers and not what actual weapons you can use. In RQ6 combat styles group together few weapons that you can use with the same ability and special effects gained by opposed rolls in combat sort of give maneuvers that you can choose to use more or less freely.